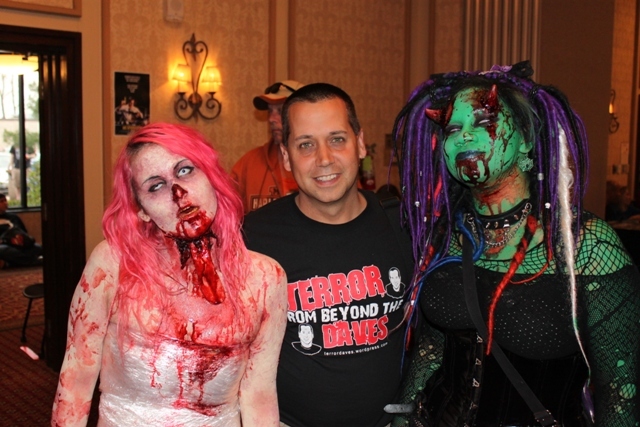 Those Crazy, Costumed Women at Horrorhound Weekend! This awesome devil creation is Jaimie Dennis. 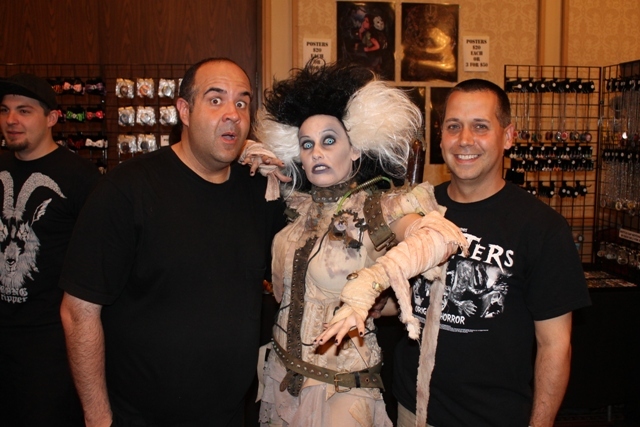 This year’s HorrorHound Weekend in Columbus, OH was a tribute to women in horror, featuring such awesome guests as Lori Cardille, Cassandra Peterson, Pam Grier, Julie Adams and Tippi Hedren. One thing that amazed me though were the women guests in costumes! Every horror convention is loaded with people in costume, usually showcasing that person’s favorite character from their favorite horror film. More often than not these costumed characters are guys, but at this event we were treated to a lot of women in costumes. What was even better is that in almost all cases the costumes were original creations and I was very impressed! As you will see below a lot of work went into not only the clothes, but in the makeups themselves! In the coming weeks I hope to bring you individual blogs on the women themselves showcasing their creativity and what started their interest in horror. This is one of my favorite characters…Lillabe Klown Wilbur by Amanda Reevenge. This is another Amanda Reevenge creation. I am not sure who this was but thought this was also an interesting creation. This amazing Bride Of Frankenstein interpretation, another favorite, is by Acid Pop Tart. This was called the Saran Wrap Zombie at the costume contest. The creator? Kelly Harris. 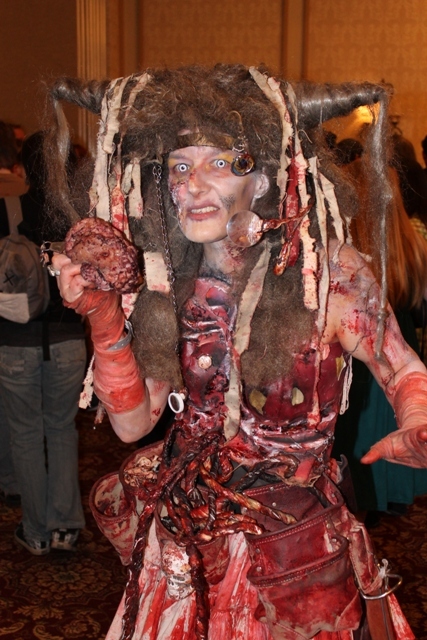 I am not sure the name of this bloody creation, but under all of that makeup is Stacia Gorsuch! Thanks to Sasha Mullins for her incredible work! As you can see there were no limits to the imaginations and creativity of these women. It was so refreshing to see something new and exciting to offset the normal Freddys, Jasons and Michael Myers. Hopefully we will be able to bring you more on these talented women soon! Also look for an overview of the costume contest, hosted by the one and only Late Dr. Lady and Miss Gory Rae! This entry was posted in Convention & Expos, Cosplay, Horror and tagged BRIDE OF FRANKENSTEIN, HORRORHOUND WEEKEND, Sasha Mullins, Zombies. Bookmark the permalink. The woman who was painted all in red is named Jaimie Dennis. She is a very enthusiastic costumer.